Being a dad has been a wild ride so far. It has challenged me in so many ways that I could have never have fathomed. Through all the challenges and obstacles I have learned so much. But I think the biggest surprise that has come with it, is that I have felt emotions that I have never felt before. I am not a very emotional guy. I don't really have high highs or low lows; for the most part I am right there in the middle. It is rare for me to be sad, takes a good deal for me to get angry, and at the same time I am also not really prone to feeling extreme joy or excitement (although I would consider my self a generally happy guy). Luckily, Melissa has enough emotion and passion for the both of us. As a result, most of our biggest conflicts come from me being unaware of how she is doing on an emotional level. My thoughts are generally more analytical in nature, which often means that I can sometimes be emotionally inept and it can be hard for me to empathize with people. If you didn't know, Roosevelt is our little miracle baby. Doctors told us it was very unlikely that we could have biological kids. So we were planning on adopting (which we still are once Roosevelt turns one). Melissa's pregnancy was a huge surprise for us, and one that I gratefully praise God for. But I just didn't feel this instant crazy connection everyone tells you about. Truthfully, I didn't really feel very much when I found out we were pregnant or when Rosie was first born. Now don't get me wrong, I was excited and I thought it was cool. I felt a nervousness about the new responsibility of having a baby and I thought it would be cool to meet her. However, I did not feel any overwhelming emotional connection. I know that probably sounds really sad or weird. But I am just being honest. This is a safe place to be honest, right? 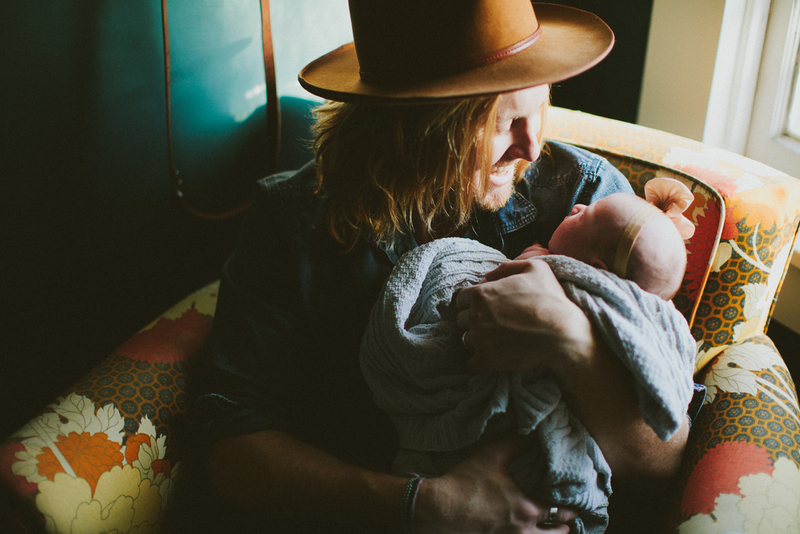 I wasn't sad, or angry, or upset or exploding with joy about being a dad. I just didn't really feel much beyond grateful and some nervous excitement. All that being said, my favorite part so far about being a Dad is how this little girl has slowly melted my heart. I have begun to feel things I have never felt before. It first hit me in the delivery room. The moment I heard her cry for the first time as she was coming out, it was a wave of emotion. I had never felt anything like that before. I can literally count the times that I have teared up on one hand, and this was one of them. I felt crazy joy getting to meet our miracle baby. I still didn't really feel the connection they tell you about, and truthfully I was scared to death to even hold her. I was really dang proud, but also totally freaked out. I had know idea what to do with a baby. I had never really held one before and had definitely never changed a diaper before. The first 2 weeks were really really hard. Rosie was a fussy little thing. The first couple days we came home and she slept like 4 hours a day total and screamed her little head off. 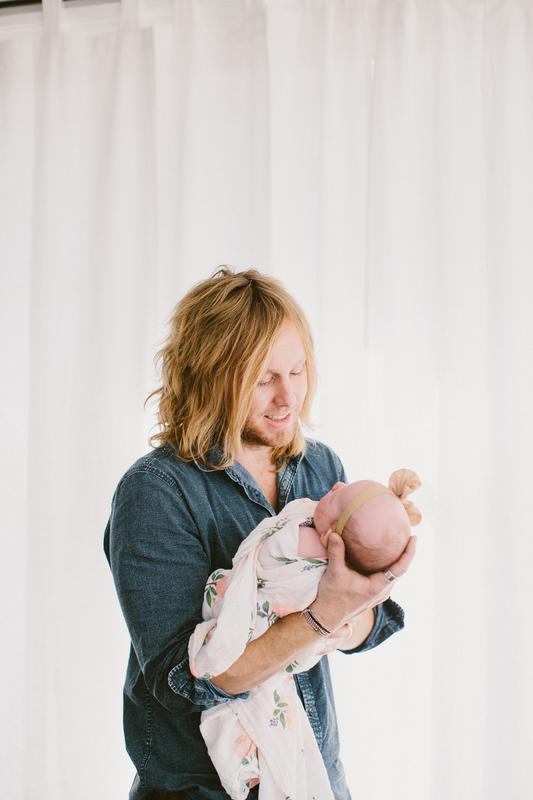 It felt great to be a dad, but man it was really difficult and we were straight up exhausted. I remember looking at her one night at 4am as she was screaming and saying to her, "I love you, but I am not really sure I like you." I even thought to myself, "I don't think I am in to babies." I know, that's probably sad, but I'm being honest. Now fast forward to weeks 3 and 4. Rosie is starting to eat more, sleep more, is no longer fussy, and she is starting to interact with me. When she finally smiles at me for the first time; I straight up melt. When she held my finger in her little hand for the first time I started feeling crazy emotions. Fast forward to week 8 and she is starting to light up, smile and giggle when she sees me and my heart feels like it is going to explode. Week 10 she starts to make noises, coo and talk to me. She laughs when she hears me talking to her. I hold her and we listen to music and read books. I am absolutely smitten. Talk about a connection. I am officially obsessed with this little bitty human. Now we are going on 3.5 months and she is smiling more than ever. She is starting to roll around and giggle. Everyone always told me that a daughter would have me wrapped around her finger, and they were absolutely right. I would do anything for this little girl. I may still be emotionally inept in real life, but I have felt emotions from being her dad that I have never ever experienced before. It took me a little bit to feel them, but I am completely obsessed. But my favorite thing she has taught me is how much God loves me. I have always known and believed that God loves me. But since I have become a dad, I have really felt that in new ways and it has taken on a whole new meaning. One night I was about to feed her and was getting her bottle ready. She started to freak out and scream as I got her in place to feed her, because she was so hungry. She had a panicked look in her eyes and even though I had a full bottle in my hand and was getting her ready to eat, she was crying. I looked at her and said, "Rosie, why are you freaking out? I'm going to take care of you. I would never ever let you go hungry. I got you girl, you're my daughter." When those words came out of my mouth, it hit me like a ton of bricks. How often does God say that exact same thing to me? How many times have I freaked out, or worried, or panicked, or had irrational thoughts and doubted that he would take care of me? It was like God was speaking to me in that moment saying, "Jamey, I love you the way you love your daughter, but even more so. Just like you would do anything in your power to provide for her I will do the same for you. I am the God of the universe and I will always provide for you. I know what is best for you and I love you. You are my son." Wow! What a special moment. As I was sitting there feeding my daughter, I meditated on the idea of God loving me just as much I love her. I was overwhelmed in that moment by God's love for me. If he loves me the way I love this little girl, what a crazy powerful love that is! As silly as it is for Rosie to cry in fear and hunger when I have a bottle in my hand preparing her for her next meal, how foolish is it when I worry and stress over things in my life when God is orchestrating it all for my good and his glory. He's got me and I've got her. Well all that being said, Dad life is pretty great! This emotionally dumb guy is feeling some pretty strong feelings for his daughter. I am thankful for it all and I am head over heals in love with this little lady.